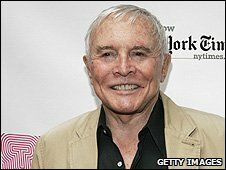 James Mitchell, who played ruthless tycoon Palmer Cortlandt on US daytime soap All My Children, has died aged 89. Mitchell, a dancer who began his career with the American Ballet Theater, died on Friday in a Los Angeles hospital, his partner Albert Wolsky said. The actor had suffered from heart disease for several years, complicated by a recent bout of pneumonia. His final TV appearance was on All My Children's 40th anniversary episode earlier this month. Mitchell had been a mainstay of the show from 1979 - 2008, playing the icy, wealthy patriarch of the Cortlandt family. "He really enjoyed it," Wolsky said of his partner's long-running role. "The meaner he could be, the happier he was. "Actors love to play the villain. He loved playing mean." Born in Sacramento in 1920, Mitchell had a degree in theatre from Los Angeles City College. Prior to his soap career, he was a Broadway star, playing lead roles in the likes of Brigadoon, Carousel, Billion Dollar Baby and Paint Your Wagon. He also toured the world with the American Ballet Theater and, in later life, taught dance and movement at Yale University and Drake University in Iowa. As a dancer, he had a brief career in movie musicals, appearing alongside Fred Astaire in The Band Wagon and Cyd Charisse in Deep In My Heart. Perhaps his most notable role came as "dream Curly" in the 1955 production of Oklahoma! Plans for a memorial service are pending, Wolsky said.